The M5 motorway was originally intended to go all the way to Larne via Carrickfergus, but was put on hold along with all others in 1975. Five years later it was decided to construct the initial section of the M5 as far as Hazelbank (sometimes called Rush Park) and dual the existing Shore Road for the next half mile as far as Whiteabbey. These were both built as part of the same contract. The dual-carriageway was constructed mostly off-line and the original Shore Road can still be found by those willing to venture off the beaten track. 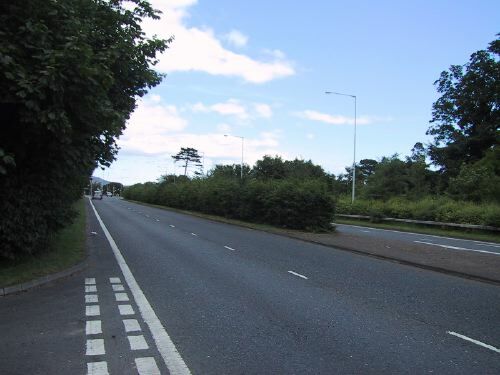 The next section of the A2 from here to Jordanstown is 4-lane single-carriageway, before reducing to 2-lane single-carriageway to Greenisland and then becoming a dual-carriageway again from Greenisland to Carrickfergus. There is currently a plan to widen the Greenisland stretch to 4 lanes. See future road schemes.